Mondo Mannequins was formed in 1989. Our mission was and is to provide the finest quality visual displays at the lowest possible prices. Today, Mondo Mannequins provides a two-tiered product line consisting of high quality stock products and diversified custom programs. Our product lines serve an ever-expanding list of satisfied customers worldwide. So whether you need immediate delivery from our stock lines, need to utilize our made-to-order products to highlight today’s hottest fashions in an upscale market, or require a complete custom solution… take advantage of the expertise at Mondo, where our many faces are your solutions to today’s ever-changing marketplace. We are confident that once you work with Mondo you will be delighted with the quality and the value that are built into our entire range of products – mannequins that create distinguished window and enhance interior displays. 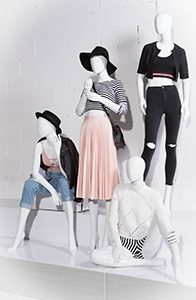 Mondo Mannequins… creating lasting impressions that stimulate sales.